﻿ Why Plan for a Commercial Kitchen? A kitchen with a smart design makes work flow easy and prevents unnecessary interruptions. It's difficult to realise how important commercial kitchen design is until you work in a kitchen which is haphazardly designed and poor in functionality. 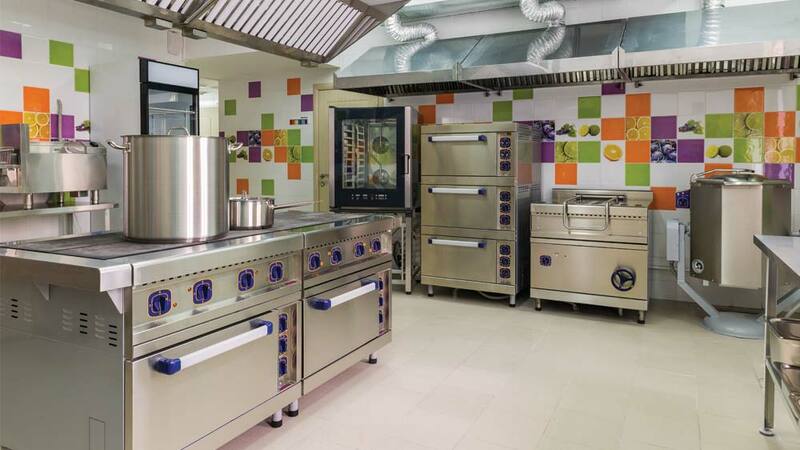 Properly designed commercial kitchens can improve your production and staff efficiency. Everything starts with the layout and design of your commercial kitchen. Your kitchen setup affects everything – from staff efficiency to utility costs. So you should take ample amount of time to create an effective layout in order for things to operate as smoothly as possible. When planning the layout for your commercial kitchen, there are several factors you need to consider while chalking out a perfect kitchen plan. First thing that one needs to keep in mind is the available space regardless of whether you are building from the ground up or placing your commercial kitchen in an existing building. Either way, you should make the most of your available space without sacrificing your work flow or speed. Most common scenario in the kitchen is employees bumping into each other which hamper the work efficiency. So a well-arranged commercial kitchen would allow employees to easily move around without bumping into one another. This is vital to maintaining a smooth-running kitchen, especially during rush periods. The theory behind ergonomics is that the fewer steps your employees take to complete a task, the better. An ergonomically designed commercial kitchen is one where employees can stand at one spot and do all their work with minimal bending, reaching, walking or turning. Ergonomics can also reduce the amount of injury, discomfort and fatigue in the kitchen. Energy efficiency should be a primary consideration for any commercial kitchen layout, as it would save money on utility costs. In an energy-efficient setup, refrigeration and cooking equipment are kept as far apart as possible while still being practical. Also, the cooking equipments should be placed strategically to maximize the efficiency of the exhaust hood. Beyond appetizing smells, the kitchen layout can appeal to customers’ other senses as well. Exhibiting kitchens, for example, allow customers to see everything that’s going on. Transparency creates an excitement amongst the customers and they would be attracted even more. Regardless of the final layout, flexibility of design should be kept in mind as is important for any commercial kitchen. A change in management or food trends could completely change the menu, which can affect equipment usage and placement. Beyond that, one should make sure that the equipment can be easily moved for cleaning. There is no definite rule on how to arrange your kitchen equipment but it all depends on the available space and your particular needs. However, there are four different arrangements that are common and can be sought before you plan your layout. In an ergonomic configuration, the kitchen equipment is arranged according to comforts and not energy efficiency. Prime objective in this type of arrangement is comfort. For example, an ergonomically arranged kitchen might have a freezer located directly beside the deep fryer. Although this is not energy-efficient, it allows frozen French fries or chicken to be moved directly from the freezer to the fryer, without even taking a step. This design serves ideal for a restaurant that mostly produces large quantities of the same foods, like pizzas or sandwiches. In an assembly-line configuration, the kitchen is structured according to the order of use, with the pieces of equipment generally in a line and sometimes linked together. For example, a pizza shop might start with the commercial refrigerator then move to the dough-shaping area, to the pizza prep table, to the pizza deck oven and finally to the warming and holding station or pizza box. As the name suggests, the kitchen is divided into different zones or blocks. Generally, there is a block for food preparation, a block for cooking, a block for refrigeration and ice machines, a block for sanitation and ware-washing and a block for the kitchen-to-server transition. There may even be multiple blocks. For example, a large kitchen may need two food preparation blocks – one near the refrigeration and one near the cooking equipment. Island-style kitchens are popular in both the residential and commercial settings. It is similar to the zone-style configuration, but there is one main block in the middle. Typically, commercial kitchens with an island-style configuration place the cooking equipment in the middle with the food prep, storage and kitchen-to-server transition areas on the outer walls. The reverse is also common; with prep equipment in the centre and cooking equipment on the outer walls.